One of the overlooked features with the BoldGrid Staging plugin is the the advanced tab that can be seen when you are deploying your Staging site. Remember that the Staging site is an option that lets you prepare a new look or even a different website to replace your existing or Active site. The Active site is what your viewers are seeing right now. Only Administrators can see the Staging site. In order to use the instructions in this tutorial, you will need to have a BoldGrid Staging site already loaded. In order to see the Advanced tab when you ready to deploy, you need to click on Deploy Staging. Don’t worry if you’re not ready, as the site will not deploy unless you click on the button labeled Launch Staging! Click on the Advanced tab. You will see some instructions on deploying your Staging site. The screenshot below is an example of what you will see in the Advanced tab. 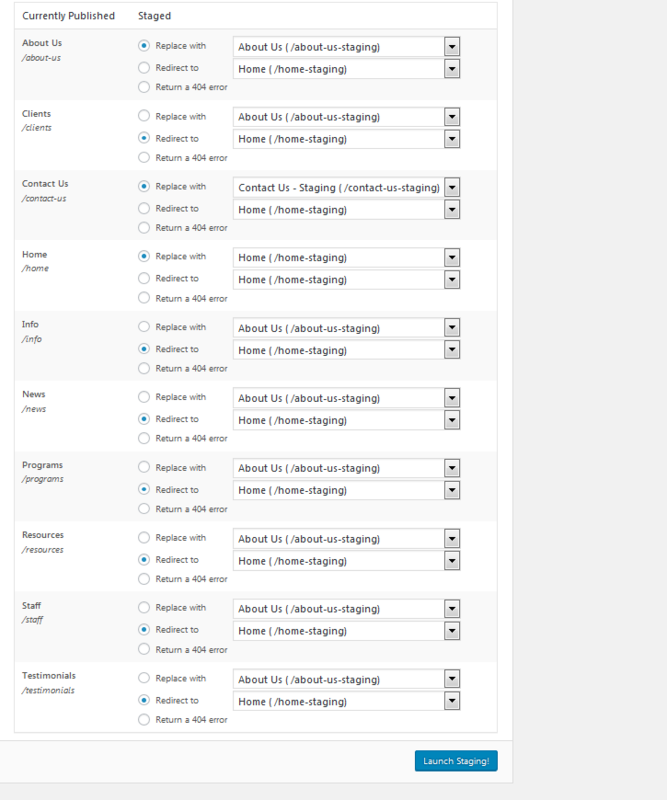 These different options allow you the flexibility to choose how the replaced sections of your staging site will appear when it is active. The Advanced tab will list all of your current active pages so that you can make a decision for each one. When you’re ready to deploy, simply click on Launch Staging! and you’ll be ready to go.